Eating is important because it can provide social time as well as nourishment for the body. With aging, some significant changes occur in the body, and these can cause problems with eating. Older people tend to have slower metabolisms and don’t need as much food. Someone who continues to eat the same amount of food as they did when younger may gain unwanted weight. If this is a problem, try serving smaller portions or shifting to lower calorie choices. With age, the mouth produces a smaller amount of saliva, which can make swallowing difficult. You can offer thick liquids and semi-soft foods. Dry foods can be a real problem, so you may wish to avoid serving them if possible. And carbonated liquids, when served with drier foods, can make it easier to swallow. As one ages, the stomach also digests food more slowly, which can be a particular problem with heavy, greasy foods. Avoid heavy greasy meals, since they can cause indigestion and that “bloated” feeling. Food also takes longer to get from the mouth to the stomach. Encourage eating more slowly and sitting up straight while eating. This can reduce indigestion and choking. Sometimes older people refuse to eat. They may lose weight and become weaker and less able to go about daily activities. Older people often lose some ability to taste foods, thus nothing much taste good. They may complain that food is tasteless and needs some zip. They may forget and think they have already eaten, so they may need to be reminded and encouraged to eat. If your older family member is not eating enough try these tips: provide small meals 5 to 6 times a day, instead of 3 larger meals; encourage nutritious snacks like fruits and juices throughout the day; and present foods attractively, keeping in mind the person’s likes and dislikes. Sometimes a decline in eating has little to do with the food. Instead, it may be because the social activities that used to go along with eating are no longer present. In short, eating may not be as much “fun” anymore. If your elderly family member lives alone, you might take the time to visit with them while they eat. The social contact can encourage eating and improve digestion. 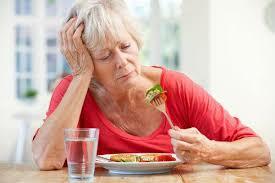 A lack of appetite and a decreased ability to enjoy food can also be the result of depression. If other formerly enjoyable activities are no longer fun, you might want to consult with a physician or a mental health professional to rule out depression as a cause. Failure to eat nutritious food can also interfere with some body functions. For example, poor nutrition can result in poor healing of wounds and skin ulcers. Some particular dietary needs of the elderly include foods high in calcium like yogurt, cottage cheese, and dark green, leafy vegetables. This help strengthen bones that tend to deteriorate with age. Fiber rich foods like whole grain bread and cereals help prevent constipation and possibly cancer of the colon. And more complex carbohydrates like pasta, beans and potatoes help maintain a high energy level. Encourage drinking water and other fluids throughout the day to aid digestion and prevent constipation. However, it may be wise to have them drink less toward the end of the day to reduce the number of times they need to get up at night. For family members who have difficulty preparing food for themselves or who can’t get out, food can often be brought to them. Services such as “meals on wheels” also provide some social contact and a chance for conversation. These programs may be either privately or publicly run. If not free, usually only a small fee is charged. Group meal programs are also available in some communities, providing hot meals and social activity. These group-dining sites are federally funded and spread throughout each state. Located in senior citizen centers, senior apartment complexes, or churches, they help provide nutrition and encourage involvement with others. Any person over 60 and their spouses of any age are eligible. Usually, a small contribution is expected, but even those unable to pay are generally served. At some sites, transportation is even provided for people who couldn’t get there otherwise. For more information about meal programs and other resources available in your area, contact Eldercare Locator for your Area Agency on Aging.